Rhodochrosite is a manganese carbonate, it’s crystal system is hexagonal (trigonal). Most often, Rhodochrosite occurs in massive, granular, botryoidal, nodular or stalactitic habits, but it occasionally forms prismatic, tabular or rhombohedral crystals. The name Rhodochrosite refers to the Greek word for it’s rose-red colour. Most Rhodochrosite is in the pink-to-red colour range, but it can also be yellowish, orange or brown. The most important deposits in Argentina, where Rhodochrosite formed in the Incan silver mines after they abandoned in the thirteenth century. 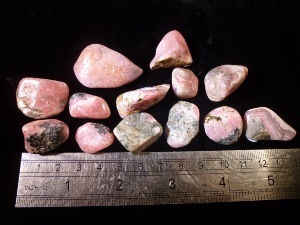 Fine Rhodochrosite crystal specimens have been found in Colorado in the Sweet Home mines and other nearby localities. 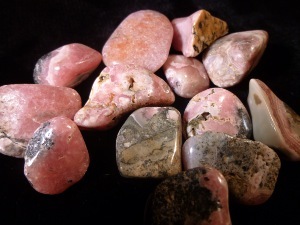 Rhodochrosite is said to be excellent anti-anxeity and anti-stress stone. Rhodochrosite is considered to be mentally enlivening. It may encourage a positive attitude and enhances dream states and creativity. Rhodocrosite from Argentina tumbled to a smooth finish, an ideal pocket size stone, small enough to carry around with you. Tumble Stones can also be placed around the home for their energies or can just be nice decorative items. Rhodocrostie crystal gemstones of varying sizes selected specially for your order.